More than 200 participants had gathered in the morning of 16 May 2013 on the monolithic premises of the Food and Agriculture Organization of the United Nations (FAO) headquarters. The building is situated in the heart of Rome, next to what is left of the ancient Circus Maximus and Baths of Caracalla, and within optical range of the Colosseum. Experts in the education sector from four continents had come together there. The motto of this year’s LINQ conference was "Learning Innovations and Quality: The Future of Digital Resources". It became clear very quickly, however, that a special focus would be on "Open Educational Resources" (OER) this year. In his keynote speech, Jay Cross of the Internet Time Alliance (USA) predicted that the bulk of the training a person will undergo during their lifetime will move away from college to the workplace. Learning, in his view, will be decentralised, requiring less teachers. Cross concluded his remarks, which the organiser of the conference, Professor Christian M. Stracke of the University of Duisburg-Essen, would later describe as "impressions from the future", by emphasising the need of Open Educational Resources to cater to these changes. According to Dr Ignasi Labastida of the University of Barcelona, at least Spanish colleges, however, often have a rather hard time publishing their educational contents, as national copyright regulations will not allow it. If not indicated differently, the respective laws - excluding all further use or adaptation without explicit permission by the copyright owner - are applied by default. Granting individual licences would demand too much administrative effort and devising a universally valid licence would require detailed legal knowledge. As a solution he introduced, in his keynote speech, the Creative Commons project (CC) of which he is the Spanish leader and which allows authors to make their contents available for re-utilisation and adaptation. Creative commons provides six different licences - depending on the way in which one chooses to protect or not protect one's content - that are tailored to the local jurisdiction respectively. In conclusion he encouraged the assembled experts to use the Creative Commons licence for their contents. The next speaker, UNESCO OER chair Rory McGreal of the University of Athabasca, Canada, also argued for digital licences instead of digital locks. He is convinced that education will and must get cheaper in the future, as many young people, not only in developing countries, will not be able to afford a college education. Another aspect he mentioned is that nowadays people all over the world already use mobile devices more often than desktop computers to access the internet. Another reason for the necessity of OER, according to McGreal, is therefore the possibility to use content on more than one device - in that respect, commercially acquired content often includes legal and technical restrictions. Like several of the previous and subsequent lecturers he mentioned so-called "MOOC''s. The acronym stands for "Massive Open Online Course'' and describes a type of interactive online seminar that originated at North American universities. 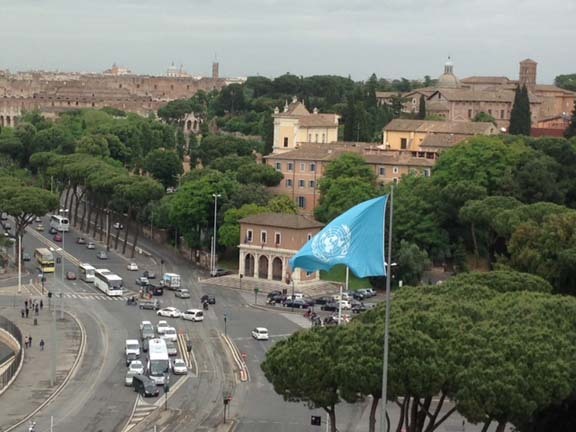 The organisers of LINQ 2013, a group of researchers from the University of Duisburg-Essen, had already been residing at the FAO headquarters in Rome the previous day in order to launch ''ICORE'' - the "International Council for Open Research and Education''. It is intended as an open NGO that bridges the gap between open research and open education. On the second day of the conference parallel sessions were held in three categories: "Invited European Speakers'', "Accepted Scientific Papers'' and "Selected EU & International Projects''. One of the invited speakers was Antonio Moreira Texeira of the Open University in Lisbon, Portugal. He introduced "innovative pedagogical models'' and identified learner-centredness, flexibility, interaction and digital inclusion as the cornerstones of such innovative models. The projects that were being presented belonged to such diverse sectors as security in freight vehicle traffic, strategies against food waste or barrier-free access for people with disabilities. Central to all the approaches, however, were strategies for technology-based learning, be it in an economical or scientific context, in school or informal educational settings. During a session about vocational education there was a discussion about how sustainability can be achieved in international projects. Professor Francisco José García Peñalvo of the University of Salamanca, Spain, who introduced the European project ''TRAILER'' (development of a strategy with which companies can make use of their employees’ informal knowledge) recommended to distribute responsibilities to protagonists outside the project during the project’s lifetime so that it can sustain itself after its run, and to provide the necessary content and technological framework to use that content - with the help of OER. The project "Digital Literacy 2.0" (DLit2.0), coordinated by the Digital Opportunities Foundation and conducted together with the Aga Khan Foundation (Portugal), Bibnet (Belgium), the Public Library of Cologne (Germany), the Regionalna biblioteka "Pencho Slaveykov" (Bulgaria), the Biblioteka Publiczna im. W.J. Grabskiego w Dzielnicy Ursus (Poland), the Bibliothèque publique d'information (France), and the National Institute for Adult Continuing Education (UK) was presented in the workshop "Innovations & Future Trends in Learning, Education and Training''. Unlike in most other projects that were presented at the conference, in DLit2.0 ICT are not just a means but also the subject matter. The project’s approach is to empower socially and educationally disadvantaged adults to participate in society more strongly by enabling them to make use of web 2.0 applications. The disadvantaged adults are approached by qualifying employees and volunteers in non-formal learning settings such as libraries, community centres and charitable institutions. The concept of DLit2.0 was met with a lot of interest by the other participants of the workshop - especially the approach to do without the teaching of basic ICT skills to the target group first and instead start with web 2.0 applications directly, which in themselves contain a high level of participation. For the Digital Opportunities Foundation and its project partners the discussions that were had and the conclusions that were drawn during LINQ 2013 provided reasons for the assumption that they are on the right track with the approach followed with DLit2.0. The trend, determined on several occasions during the conference, from formal to non-formal education is accommodated through the fact that in its two-step training campaign "train the trainer & qualify the user'' staff explicitly in non-formal learning settings are qualified as trainers. Particularly disadvantaged adults as a target group cannot be approached easily via conventional learning offers. The cornerstones of innovative pedagogical models, as identified by Dr Antonio Moreira Teixeira (s.a.), - learner-centredness, flexibility, interaction and digital inclusion - were at the basis of the development of the DLit2.0 training material. In order to achieve sustainability, the DLit2.0 partners are planning to make the project known throughout Europe and find partners who are willing to adopt its approach and strategy. The presentation of the project at an international conference such as LINQ 2013 made a contribution to that. In addition, it is planned that the DLit2.0 material will be made available as OER for other professionals and institutions to re-use and adapt after the project’s run. The organisers invited all participants to attend next year’s LINQ conference: LINQ 2014 is planned to be held on 12th and 13th May 2014 on the Greek island of Crete. Digital Opportunities Foundation plans to apply again for the opportunity to then present the results of the project "Digital Literacy 2.0".